Congress is busy trying to figure out how to fund the federal government for fiscal year 2018. On Wednesday, both the budget and appropriations committees in the House of Representatives met to discuss their plans. Both proposals include changes to the funding of the Pell Grant program that will destabilize its foundation moving forward. Looking at the big picture, the House Budget Committee voted on its budget resolution, a guiding document for all government funding over the next 10 years that sets target spending levels for each of the 12 subcommittees. In a reversal of normal business, the House Committee on Appropriations simultaneously voted 28-22 on party lines to move a spending bill from the Labor-Health and Human Services-Education Subcommittee to the House floor. This bill cuts $2.4 billion from education excluding changes to the Pell grant reserve fund. The bill removes a teacher preparedness program to save the majority of those funds. In addition, the appropriations committee bill removes nearly $3.3 billion from the Pell Grant reserve fund, which will make it more difficult for the program to sustain another downturn in the economy. The reserve fund accumulates from carry-over funds during years when fewer Pell Grants are needed than appropriated, and the extra funds provide a cushion in years when more dollars are needed than appropriated. The fiscal year 2017 appropriations already moved $1.3 billion from the reserve fund last year, so this would an additional rescission of funding. TCASN joined NCAN and fellow NCAN members Michigan College Access Network, Scholarship America, uAspire and nearly 40 other organizations in signing a letter to House appropriators opposing these cuts, which NCAN member The Institute for College Access and Success (TICAS) organized. This appropriations bill does not include the severe cuts across all programs proposed in President Trump’s budget. In fact, it increases funding for GEAR UP and TRIO programs and preserves other programs slashed in the president’s proposal, including Subsidized Stafford Loans, Federal Work-Study, and Supplemental Educational Opportunity Grants (SEOG). Without Congressional action, the Pell Grant maximum award will remain at $5,920 for all future award years, and appropriators' openness to one of NCAN’s top advocacy priorities is a sliver of hope to extend the expiring increases. As the funding process continues on the House floor and moves to the Senate, NCAN encourages Congress to revisit this issue. There should be flexibility for this increase given that the overall cuts in this bill are larger than required to meet spending caps mandated in the Budget Control Act of 2011. Also on Wednesday, the House budget committee met to discuss its fiscal year 2018 budget resolution that sets the top-level funding targets for all areas of the government, led by Chair Diane Black (R-TN). Presented first on Tuesday as the Building A Better America: A Plan to Fiscal Responsibility, the top-level funding numbers for each area of the government. This year is unusual because typically the budget resolution passes before the appropriations committee does its deep dive already discussed above, but this year the budget committee fell behind. The President does not sign the budget resolution. The Building a Better America proposal includes $211 billion in cuts over 10 years to education programs. The mark-up provided few details, however, other than to indicate that this proposal would make Pell Grant a purely discretionary program and that it would adjust student loans to create large savings over the next 10 years. Currently, the Pell Grant program receives some of its funding from mandatory dollars. This shift would make it easier for a future Congress to decrease its support of the program or to make eligibility changes. But the budget resolution passed to the House floor near midnight on party lines, 22-14. The "Better America" proposal claims that the Pell Grant is “on shaky financial ground,” and that future reforms should ensure that “this program is financially sustainable and available for future students.” However, it offers no evidence to this point, other than to note that the program has rapidly increased in size. But according to the Congressional Budget Office projections, the program is stable through 2024. What does all of this action in Washington amount to? It's too early to tell. While the budget resolution passed out of committee on party lines, Politico reports that the GOP is several votes short of passing the budget through the entire House. Additionally, Congress is running out of time to pass all 12 appropriations bills, which are what constitutes the legal spending plan for fiscal year 2018. Those 12 bills must pass both the House and the Senate. Without bringing the two chambers together by Sept. 30, there could be a continuing resolution, or “CR” in Washington-speak, which will simply extend the current funding levels through next year, or whatever portion of next year the Congress decides. Based on the proposals under consideration in the House of Representatives right now, a continuing resolution may actually be the best outcome for students because it would keep the most funds in the Pell Grant program and not make changes to any other federal aid or support programs. Advocating for a strong federal student aid system to support our low-income students remains NCAN’s top priority. 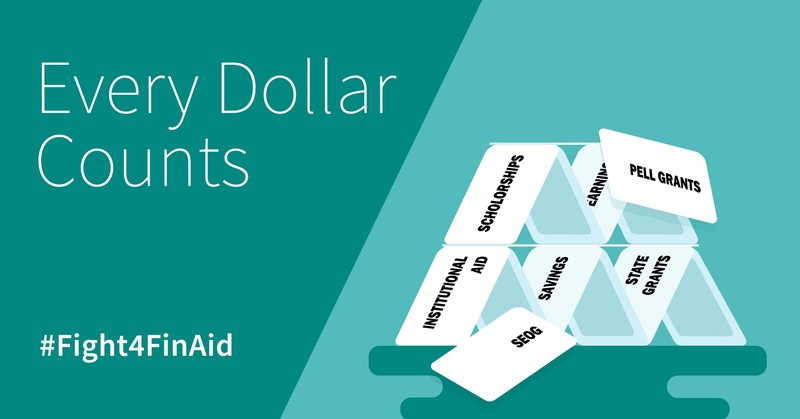 As the House moves forward and the Senate begins its appropriations process, continue to watch our blog and Twitter feed for updates on the possible impact that changes to the aid program, particularly the Pell Grant, will have on our students. Graduate Policy Intern Courtney Argenti contributed to this report.